Every once in a while, you will meet someone who will inspire you to live your Life differently. Soak in that inspiration and every time you feel desperate or depressed about something in Life, employ that person’s spirit, his or her joie de vivre, to revive you! 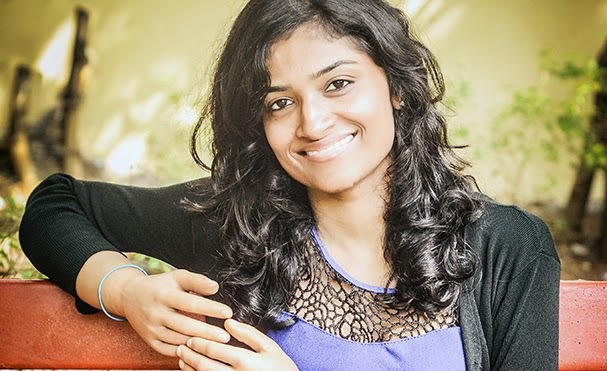 Last week we met one such person – Malvika Iyer. She’s a bilateral amputee, who lost both her hands in a bomb blast in Bikaner, Rajasthan, caused by a fire in an ammunition depot. It was a near fatal accident. Her two legs were badly injured too – she had multiple fractures in both of them; nerve paralysis in the right leg and hypoesthesia (loss of sensation) in the left leg. She was barely 13 then. She was hospitalized for 18 months and went through multiple surgeries in hospitals in Jaipur and Rajasthan. Today, almost 12 years on, Malvika is a Ph.D. Scholar and Junior Research Fellow at the Madras School of Social Work. She made up for the time she lost while she was in hospital, by completing her 10th standard through a private appearance – she scored 97 % overall, with a 100 % each in Math and Science! Importantly, she finished in the same year that she would have, had she not met with the accident; which is, she did not lose an academic year! Malvika then went on to graduate from the famed St.Stephen’s College, New Delhi, even as she worked extensively with differently-abled children at the Centre for Child and Adolescent Well Being in New Delhi. We went to meet Malvika, armed with all this information – of an achiever who had succeeded despite all the odds. But we ended up meeting the most down-to-earth person ever, a girl-next-door, who wore her ‘specialness’ on her sleeve. She is aggressive but not bitter and combative, she’s resolute but not abrasively feisty, she’s accepting of her ‘special’ condition but not apologetic, she’s conscious of her future – and the challenges it will bring along – but lives every moment to the fullest! Malvika says that she realized early on that camouflaging her disability was not a solution to her problem. Accepting the way she now was and living with the awareness of what she can and cannot do, was the only way, she reckoned, to live her Life fully, meaningfully! There’s an infectious air of positivity about Malvika. Sitting with her you can feel your confidence levels receive a boost. You know that you too can face Life – squarely and with a smile! Behind Malvika’s quiet courage is her mother Hema’s unflinching support. Hema says Malvika’s accident changed their entire family’s attitude to living. Fear, insecurity, worry, anxiety – all these emotions, says Hema, did not mean anything, anymore. That Malvika had survived and that she had to live a full Life began to engage the entire family. So when Malvika – who chose not to wear her prosthetic hands when we visited her – whips out her smartphone and sends you a Friend Request on facebook, all by herself, without having hands like you and me, you know how right Hema’s been with dumping wasteful sentiments like self-pity and bitterness and encouraging Malvika to live and celebrate Life! It is but natural to get stumped by one of Life’s blows. It takes time to make sense of what’s going on when Life socks you and shocks you. You don’t know how you are going to cope with your new reality. You don’t even know if you will make it, if you will survive to tell your tale. Surely, Malvika’s Life too went through precisely the same pattern, but where she changed the game for herself is to accept – and not resist – her new reality. From her acceptance, an inner peace was born. And that’s the resoluteness, the quiet courage that reflects in her. She employs this spirt to live her Life fully – unshackled by the past and undaunted by the future. We came away inspired after meeting Malvika. You can all it the “Malvika Effect”! We were particularly delighted that she had accepted our invitation to receive the first copy of my forthcoming book “Fall Like A Rose Petal – A father’s lessons on how to be happy and content while living without money” (Westland) when it releases in August this year! I will carry the memory of this meeting in me for a long, long time – for it is not often that you meet someone who reminds you that you have, well, met Life!